What do I like about this recipe? –It’s origins. 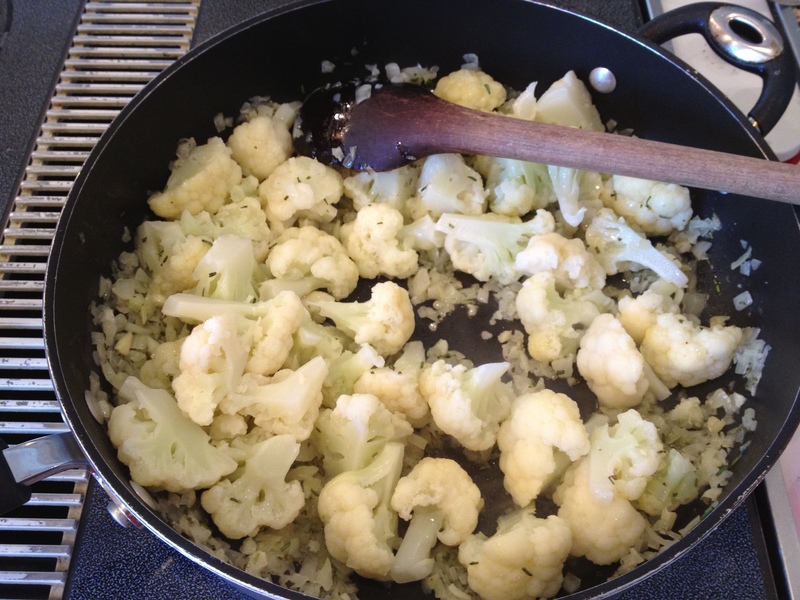 The recipe appeared in Food & Wine’s April 2013 edition. The dish was created by Dario Barbone and Renato Sardo, two Italian chefs from Piedmont. I visited Piedmont a few years ago with my best friends. Before we arrived in Piedmont we were lost in the area and circled around in our rental car for a few hours. But being lost in Italy with a view to the Alps is not a bad thing and we knew we’d find our way. When we arrived at our B&B, it was like coming home to a warm fireplace after a long day of skiing. The weather was chilly and our hosts, John and Elio, an American and an Italian who alternate their time between Piedmont and Italy were so gracious. Their B&B, Villa Favolosa, was lovely. Most of the furniture on the property was original. There were beautiful antique pieces dispersed between the bedrooms and common areas. For breakfast one day they served us a magnificent truffle frittata. (I cant remember if Elio’s mom or grandmother made it but it was delicious all the same). Then there was this homemade jam to spread on the just-out-of-the-oven italian bread. I wish I could have stayed for a few months to learn from Mama…or Nona. The bottles of complimentary wine at our bedside tables and the crisp lemon scent cotton linens were unforgettable. I slept like a baby on our arrival night. At this B&B it was all in the details. Villa Favolosa won my heart and prompted me to submit an entry about the B&B on Trip Advisor. Check it out when you have time. 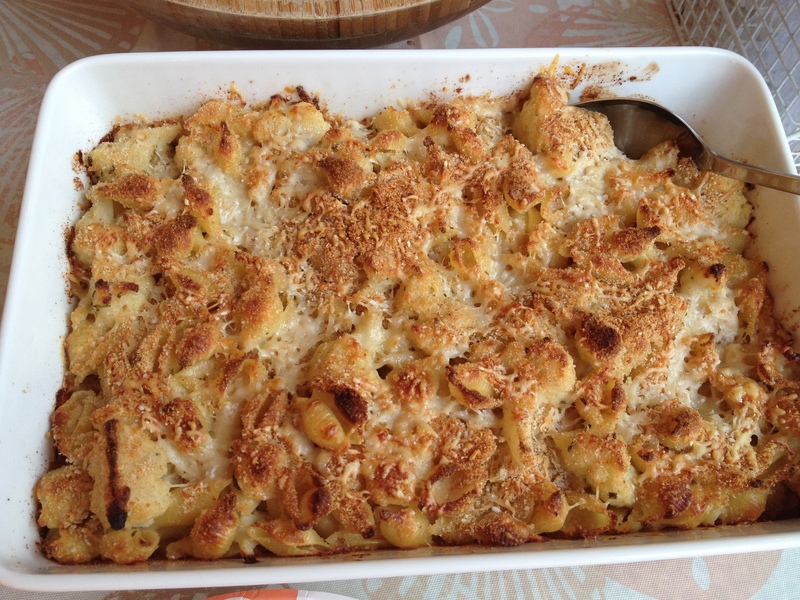 Getting back to the Baked Shells…when I read about the creators of this recipe it took me back to those days we spent in Piedmont. To our lovely hosts, John and Elio, if you ever read this: I want to sleep in the room with the twin beds again. I mean the one with the best, brightest and cleanest shower in Europe! P.S. I’m sorry for wasting so much water during our stay but the shower felt really good. Our neighbor (Juancho) planted a banana tree in our backyard several years ago. You should know that a banana tree bears fruit only once. While it grows smaller sprouts come up and these give rise to new trees…and more bananas. Needless to say we have enough bananas to make a community of monkeys very happy. Us monkeys can’t keep up with the banana harvests. Fotog foodie’s blog came to the rescue. 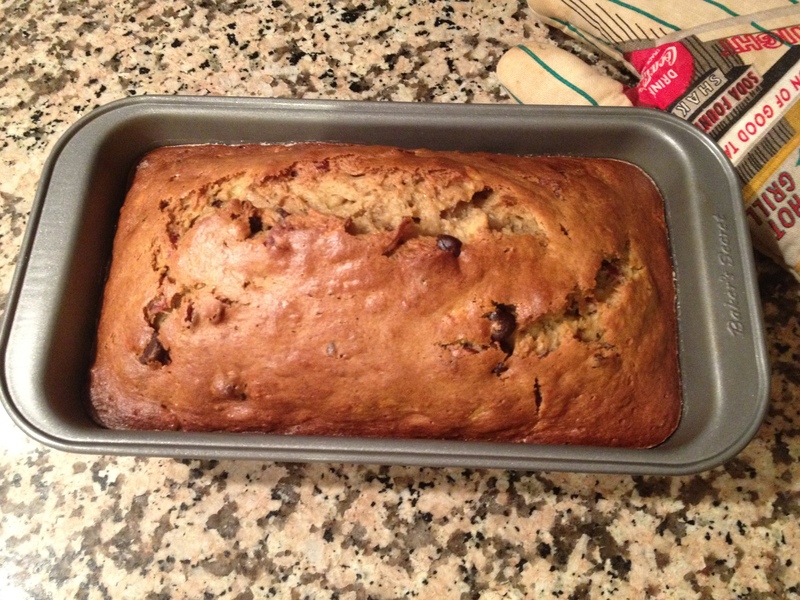 The Blog author says she has made this version of banana bread at least 100 times. At the rate our bananas grow, I will soon catch up to fotog foodie. I probably should stop baking these “walk-by” foods. Everytime you walk through our kitchen and see a porcelean plate that has a dishtowel draped over it, you can bet there’s a treat underneath. You wonder what it is, lift the towel and smile. You slice off a piece and walk to the TV…and catch the rest of the Heat Game…then you walk back for another slice…No one goes to bed feeling guilty because they’re all convinced it’s mostly healthy stuff: bananas, cranberries, chocoloate and brown sugar. There are variations. 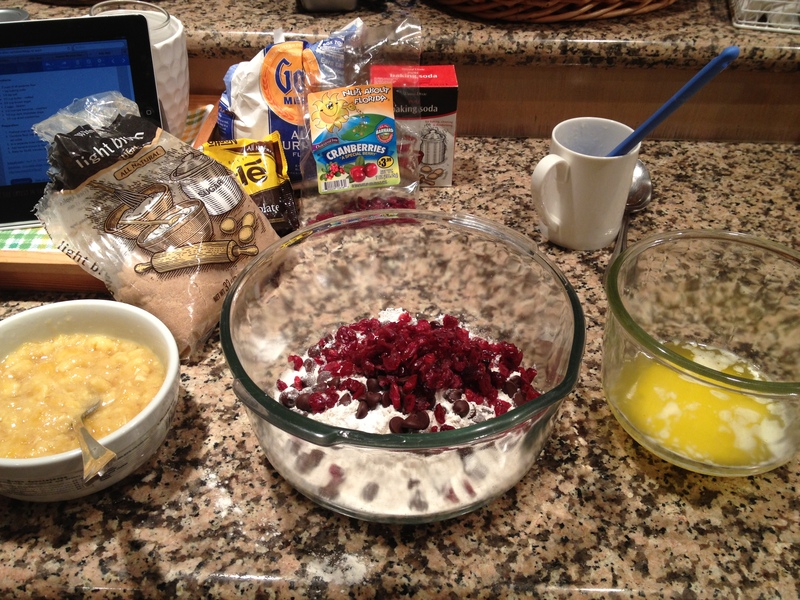 You can add or subtract the cranberries or chocolate chips, for example.